Utilities an extra $35/week , including fox-tel GO, netflix, gas, cleaning products and unlimited NBN (fastest speed available). I have a room available to rent in a comfortable drama free home. Respectful and honest people are welcome. We are friendly people and although we accept and get along with everyone.... we are after drug-free and sober person to share our home with. We are not heavy drinkers and although moderate drinking is welcome no excess drinking on the property is tolerated. I'd like everyone in the home to feel safe and happy. The suburb borders Modbury North and is less than 5kms to Mawson Lakes. It is easy to catch a very short bus ride to ingle farm and then a bus that drops you off at the Uni at Mawson Lakes. The house is central to three shopping centres: Tea Tree Plaza, Golden Grove and Ingle Farm. Several buses are readily assessable and are caught around the corner within 100m from the house. There is off road parking for those with a car. Furnishings are included in the rent. A queen size bed, wardrobe, chested draws. Utilities are included in the rent for $165/week. Electricity, gas, water, unlimited wireless NBN complete optical fiber internet (FFTP as opposed to the cheaper NBN with the cooper to the door) with the fastest speed optional of up to 50 megabits per second, netflix and foxtel Go to share. There are not extra bills to pay. Cleaning products are included in the utilities. The room is comfortable. The room has an evaporative cooling duct, ceiling fan and key lockable door. Furnishings include a queen bed, wardrobe, dresser, cube storage and a desk. The furniture is all optional and can be removed if needed. Everyone is required to clean up for themselves. Basically each person is asked to clean/garden for 1.5 hours per week. Job tasks are semi-flexible and can be negotiated. For those that don't want to clean, they are welcome to pay and extra $25 a week to have their jobs done for them. The option to work for extra cash is available to skilled handy tenants. $15 per hour is paid off next weeks rent. 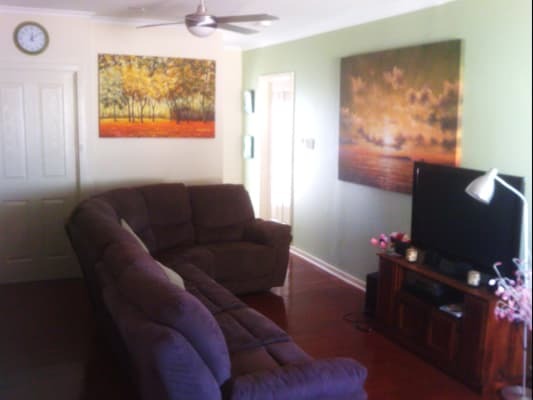 The house has been renovated and is comfortable with new modern appliances. It has Air conditioning, evaporative cooling throughout the house, ceiling fans, 2 portable air conditioners, gas heating, gas cooking, gas hot water, modern cooking equipment a luxury spa bath and more. The backyard is almost finished being renovated and is quite atmospheric in a quirky way. The permeculture project in the back yard is almost finished. This combines aqua culture and horticulture. I have a cat, fish and birds. Besides the cat all the animals are in cages. 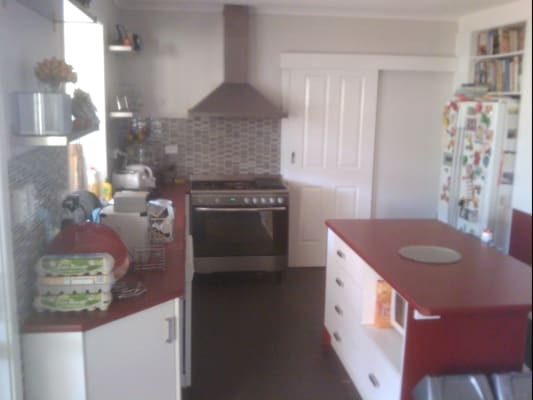 Animals lovers would love it here... a pet tolerant tenant would suit the place. Pets are negotiable. The house is friendly but not a party house. No illegal substances are welcome on the property along with no excessive drinking or substance abuse. Household members are expected to treat each other with respect and with a mature responsible attitude. The house is to be each household members home and everyone feeling comfortable is a priority. Smoking outside only. If you feel like this place is for you, please apply. Two weeks bond and two weeks rent is required to move in. A reference would be great. To move out two weeks notice is required. Minimum stay is 8 weeks which helps keep a stable environment. I hope to hear from you soon. A phone call or text is the quickest way to get a response. I find It easier to get along with 4 good people than one difficult person. The house is very drama free and respectful. We all work and although we are friendly it's we are not a party house. Males work full time, are quiet, respectful and keep to themselves. For their current full time employment they have had to be police checked. The 18 year old male works casual and is very easy to get along with. I am 41 years old and love life.I am the landlord which makes it easier for all. I study, work and have a hobby business with birds. I'm quite extroverted, love to dance and enjoy the simple things like having a laugh... often at my own expense... ha. I consider myself to be quite fair, organized and respectful. We are not heavy drinkers and like that there are no heavy drinkers in the home. As I am a female, safety is a priority here and no abusive behavior is tolerated which is comforting for others in the home as well as myself. Overall we are far from nit pickers, down to earth and easy to get along with. We don't fuss over little things and as long as people feel safe and rent is paid we don't fuss over other stuff. Life is way to short!